The W.H.O. calculates that 50% of the world population experience headaches in any given year (1). There are many different types of headaches including migraine, tension-type, cluster and medication-overuse headaches. Acupuncture is pretty remarkable in that it can reduce pain via multiple pathways in the body. In Chinese Medicine, most pain is characterized by a blockage of qi and blood in the meridian system, and the mechanism for reducing pain is to unblock the channels to get qi and blood moving again. In scientific terms, and supported by quality research, acupuncture is thought to perform multiple actions that modulate pain including, but not limited to, promoting blood flow (5, 6), releasing the body’s own natural painkillers (6), balancing the body’s stress responses (5), stimulating healing through micro trauma (5), and reseting the nervous system so that the body can correctly address chronic injury and pain (7, 8). Multiple studies have shown acupuncture’s ability to reduce headaches, while working as good if not better than pain medicine, and having lasting beneficial results. For example, randomized controlled studies reviewed by Evidence-based Complementary and Alternative Medicine found that acupuncture was able to reduce migraines in almost 3/4 of participants by 50% or more. Both pain, quality, duration and need for medication were reduced in the majority of participants (2). Cochrane reviewed 12 trials with over 2,000 participants comparing pain medication to a combination of pain medication and acupuncture and found that half (50%) those who received acupuncture in addition to pain medication had headaches reduced by at least half (50%). This out performed pain medication which only reduced 17% of participant’s headaches (4). The British Journal of Medicine concluded from randomized controlled studies that acupuncture reduces headaches (9), and the Journal of the American Medical Association (JAMA) found that acupuncture has long lasting pain reducing affects on those with chronic migraines (10). In short, some of the most renowned peer reviewed medical journals are reporting on the ability of acupuncture to reduce pain in those experiencing chronic and acute headaches, sometimes significantly out performing medication. Considering that there are almost no side effects from acupuncture, compared to devastating side effects from prescription medications such as opioids, and rebound headaches from other common headache medications, it makes sense that more and more people experiencing pain should give acupuncture a try. How often should I receive acupuncture for headaches? 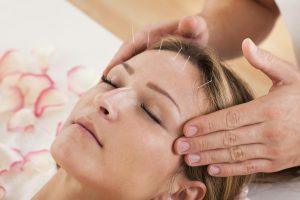 The University and Royal Melbourne Hospital researchers concluded, “Acupuncture can be used as alternative and safe prophylaxis for frequent migraine. Our recommendation is that practitioners treat migraine sufferers twice per week for at least eight weeks.” (2) At Lakewood Community Acupuncture, we recommend receiving acupuncture twice a week as you begin treatments, and then as your headaches reduce considerably, and the patient has no headaches between sessions, gradually spreading out treatments. We also recommend cupping therapy as an additional method of relaxing the upper back and neck muscles, in combination with acupuncture.